Happy Book Birthday to Digging in the Stars by Katherine Blakeney! Be sure to check out this amazing book! 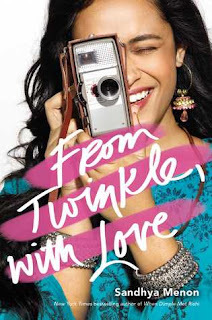 I have only read a little bit of it, but I must say this book is just brilliant! 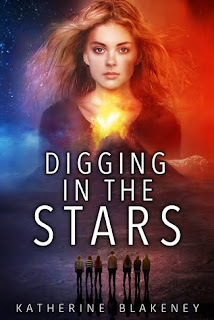 A lost ancient civilization and the tomb of a legendary king lie buried beneath centuries of ash on the volcanic planet Thror, but that's not the only reason sixteen-year-old Carter has tricked her Archaeology of Outer Space class into coming here. Her best friend Conrad has just disappeared on a trip to Thror, leaving behind little more than a broken vintage camera. The strange and disturbing photographs she manages to extract make her suspect Conrad's disappearance is somehow connected to the hidden tomb of the last king of Thror. Coded messages, stunning ancient ruins, and clues left by Conrad himself begin to surface as the young archaeologists fall victim to an alarming series of accident stages by the increasingly hostile Furry Giants. Piecing together a history of dictatorship, terrorism and disguise, Carter glimpses the horrors beyond Thror's flamboyant façade and startling revelations about the friend she thought she knew. The masks of Thror hide devastating secrets, and the golden tomb buried deep in the frozen core may claim the lives of everyone she loves. If you like the sound of this book be sure to follow this link that will take you to the Blaze Publishing site for all of the purchasing links! Thank you all for joining me today! Be sure to grab yourself a copy, for I believe that you will not be disappointed!